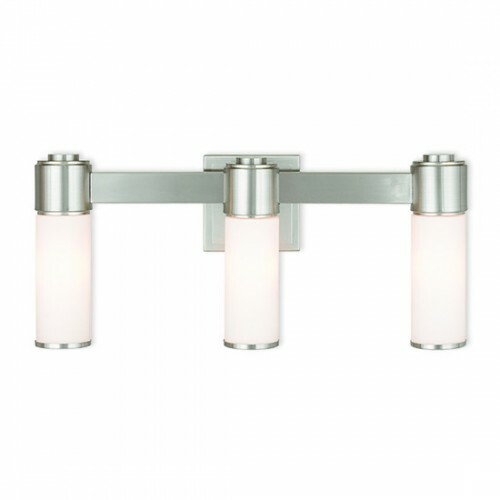 This stunning design features a brushed nickel finish studded with hand blown satin opal white glass. This sleek design will brighten up bathroom. Pair it with the mini chandelier to give your bath that extra wow factor! Downlight - 2.5" Uplight - 7.25"
Livex Lighting is a manufacturer and distributor of decorative residential lighting. Our company was founded in 1993 and is now headquartered in a 150,000 square foot facility in Somerset, New Jersey. Please visit your local lighting showroom or shop online with any of our authorized dealers to view our extensive product line to see what Livex Lighting is all about.